BRUSSELS, Belgium -- 56 foreign ministers of OSCE participating countries unanimously voted for Ukraine's chairing the OSCE in two years from now. The Chairperson-in-Office is the foreign minister of the country that holds the Chairmanship. 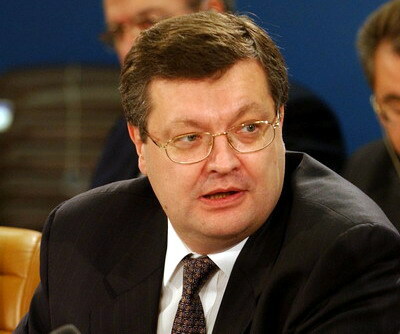 Current Minister of Foreign Affairs of Ukraine Kostyantyn Gryshchenko is a potential Chairman of the Organization in 2013. The President of Ukraine believes that Ukraine's chairmanship will provide more opportunities for strengthening security from Vancouver to Vladivostok, as the Organization is the center of debate on the future of European security architecture. Earlier, in September, the President of Ukraine underlined his hopes for Kazakhstan's support for Ukraine in attaining chairmanship of the Organization in 2013. The President noted that the experience of Astana should be taken into high consideration. Kazakhstan's Foreign Minister and Secretary of State Kanat Saudabayev is the current Chairperson-in-Office. "I sincerely congratulate Ukraine on the occasion of being awarded the esteemed OSCE Chairmanship in 2013. We wish our Ukrainian partners and friends success in the implementation of this responsible mission and the proper continuation of efforts of previous Chairmanships to strengthen and develop the OSCE in light of new geopolitical realities," Saudabayev said. The Minister of Foreign Affairs of Ukraine, Kostyantyn Gryshchenko, has stated that "Ukraine, as a non-aligned state will continue to carry out its constructive unifying role in the security dialogue, taking into consideration opinions of all the states of the OSCE region; and will take up a balanced position in respect of the acute issues of the Organization." On top of that, Kostyantyn Gryshchenko said that Ukraine would specify its key elements of the upcoming chairmanship before 2013. "Ukraine's chairmanship in the OSCE is a sign of growing international confidence in the new Ukrainian leadership, which our state lacked in the past years," says Oleg Voloshyn, the Head of Information Policy Department at the Ukrainian MFA. The next OSCE Summit of Heads of State or Government will take place in Astana, Kazakhstan, on 1-2 December 2010. It is the seventh such Summit in the OSCE's history. Previous summits were held 1975 in Helsinki, 1990 in Paris, 1992 in Helsinki, 1994 in Budapest, 1996 in Lisbon and 1999 in Istanbul.